Rüsselsheim. The full name of the new Opel engine is 1.4 ECOTEC Direct Injection Turbo and it will celebrate its world premiere in the new Opel Astra at the International Motor Show in Frankfurt (IAA) in September. The four-cylinder turbocharged unit with central direct fuel injection will be available in two outputs, 92 kW and 110 kW. This combination links the new all-aluminium engine to the recently introduced 1.0 ECOTEC Direct Injection Turbo known from Opel ADAM and Corsa. In fact, the new 1.4-litre four-cylinder engine is the big brother of the one-litre, three-cylinder unit that has been praised by the trade press since its introduction in the ADAM ROCKS and the new Corsa generation. Both engines are members of the so-called small petrol engine family – a group of high-tech engines with three or four cylinders and a displacement below 1.6 litres. They are key players in the biggest engine offensive in Opel’s history which will see 17 new engines brought to market from 2014 to 2018. A lot of attention was paid to dynamic responsiveness and high performance while curbing fuel consumption during the development phase of the 1.4-litre turbo. The engine delivers maximum torque of up to 245 Nm very early. The maximum power is available between 2,000 and 3,500 rpm – an outstanding torque plateau. Perfect conditions for driving pleasure in combination with efficiency. According to preliminary data, the powerful turbo with Start/Stop will consume a mere 4.9 litre of petrol per 100 kilometres in the combined cycle (114 g/km CO2). The 1.4-litre turbo will therefore be able to outperform even two-litre gasoline engines in all performance characteristics and replace them. The engineers once again paid close attention to low noise levels and vibration behavior during the development of the 1.4-litre turbo – just like they did for the one-liter, three-cylinder unit. The engine block was constructed with resonance reduction in mind, the oil pan split into two, the integration of the cylinder head into the exhaust manifold is noise protected, a sound absorbing cam cover has been designed, the high-pressure injection valves decoupled and the timing chain trimmed for quiet concentricity. “Our new turbocharged 1.4-litre, four-cylinder engine with central direct injection is part of the newly designer small gasoline engine family and embodies its attributes ‘powerful, efficient and cultivated’. The all-aluminium unit is not only environmentally friendly but also sets new standards in driving comfort,” said Christian Müller, VP GM Powertrain Engineering Europe. 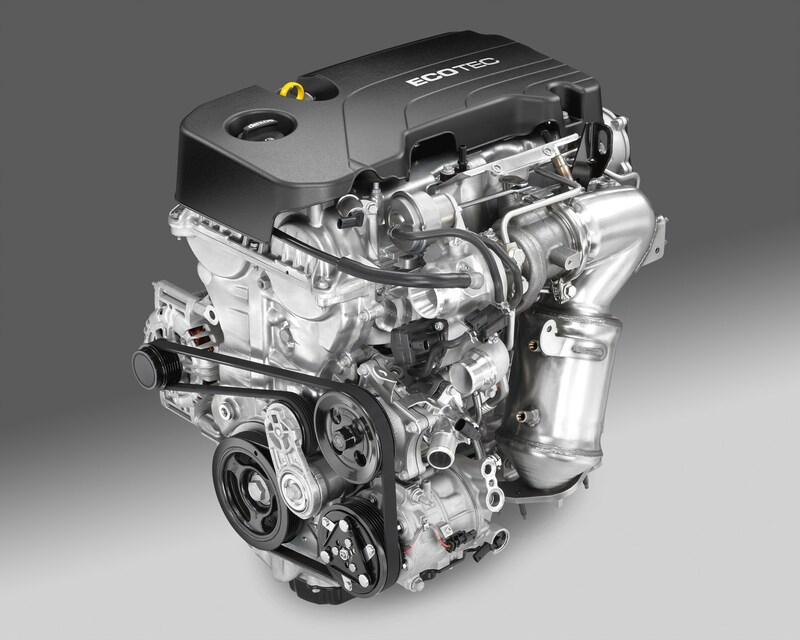 Based on its construction, the new 1.4 ECOTEC Direct Injection Turbo adds less weight to the car. The aluminum engine block alone weighs ten kilograms less than the cast-iron block of the current 1.4-litre turbo, making it the perfect match for the new, highly efficient Opel Astra. Apropos efficiency, this is where the 1.4 turbo can really show its technical advantages: to make the engine as light as possible, the crankshaft is hollow cast, the oil pump drive is especially low friction and the oil pump works in two pressure levels accordingly. The entire engine is designed for low friction oils with a viscosity grade of 5W-30. All of these measures ensure fuel efficiency of the highest standard. While the three-cylinder Opel units are typical representatives of engine downsizing (smaller, lighter, more efficient), the Opel engineers speak of “rightsizing“, i.e. the perfect balance between low load and high load efficiency, when talking about the new 1.4-litre four-cylinder engine. The 1.4 ECOTEC Direct Injection Turbo is manufactured in the Opel Flex Plant in Szentgotthárd. And it is already responsible for setting a new milestone for the Hungarian plant. The eight millionth engine from Szentgotthárd left the production line today and it was, of course, an all-aluminium, four-cylinder unit that will make its debut in the new Opel Astra from September. “We have world class flexible engine plant in Hungary and it plays a key role in our product strategy. Congratulations and a huge thanks to the entire team here – eight million engines is something to be very proud of and I am sure that we will be able to celebrate even more milestones here in the future,” said Peter Christian Küspert, Vice President Sales & Aftersales Opel Group, who attended the celebrations along with Marc Schiff, Executive Director Manufacturing Opel/Vauxhall Europe, members of the Hungarian government and local officials.